Press A to learn about all the different types of 2-XL robots, and the programs that go with them. ...and lots more extra stuff about 2-XL! Press C to learn about other robots Dr. Freeman has invented, including the newest member of the family, Kasey the Kinderbot! Please push A<!- Wait until he says NOW or you will PAY!!! ->, B, or C, Now. To return to Platypus Power, push the Question button. On nearly every page you will find a guide robot (a 2-XL or a Kasey the Kinderbot) in the upper left corner. You can always click on their buttons to take you to new pages in whatever topic you've selected. In most cases, the Question Button will take you back to the previous index page you just left. Kasey the Kinderbot also has an orange HOME button located underneath his screen, which will also usually take you to the previous index page you just left. If you leave your mouse on any button, a guide will pop up to tell you where that button goes. These are also listed under each guide robot for your convenience. If at any time you got lost or confuuuused (as 2-XL would say), just go to the Site Map at the bottom of every page. This will take you to a listing of ALL the pages in the World of 2-XL site, and you can go directly to any one of them. Thanks for coming, and enjoy! SO WHAT'S ALL THIS FUSS ABOUT "KASEY THE KINDERBOT" ON A 2-XL SITE? 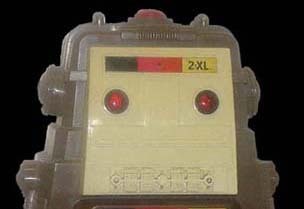 Most simply put, Kasey the Kinderbot was the most recent incarnation of 2-XL! Like 2-XL, Kasey was invented by Dr. Michael Freeman, asks questions, has 4 buttons on his chest, and operated on different programs. Since Kasey the Kinderbot is a direct descendant of 2-XL, I have including news on Kasey here as well! Where can I find 2-XL tapes? What kind of plug does 2-XL use? Can this site provide me with replacement booklets? So just what is this thing? 2-XL was made by Dr. Michael J. Freeman, Ph.D, an inventor with an interest in educational robots. 2-XL's basic function was to teach, hence his name, "To Excell." However he did it in a way that was entertaining for both children and adults. 2-XL could ask questions, tell jokes, play games and puzzles, and even had an interactive game called "Tri-Lex," which was a cross between checkers and tic-tac-toe. He was not only educational and entertaining, but he was friendly too, and played some pretty cool music (although his singing, by his own confession, was pretty bad). In short, 2-XL was a toy that had a big impact on my childhood. This site is dedicated to spreading the word to others out there who may also fondly remember 2-XL, wherever you may be. "Let's go now to our news room in the big city of Tuscaloosa!" October 24, 2012: 2-XL SPEAKS FOR THE FIRST TIME IN 20 YEARS!! If you've seen the movie Argo, you've probably noticed that good ol' 2-XL has a cameo towards the end of movie. If that wasn't exciting enough, 2-XL has something to say about it! Check out this video that he recently posted to YouTube!! If the embedded video isn't working for some reason, you can go directly to the video on YouTube at http://www.youtube.com/watch?v=4JepqqHgUls. September 18, 2009: FOLLOW 2-XL ON TWITTER! Yes, 2-XL is now on Twitter, and he'll be asking a question or telling a joke every day! Twitter is totally free. Follow him at https://twitter.com/2xlrobot! UPDATE: Okay, I confess, that was me. (As if it wasn't obvious.) It was a nice idea but I never kept up with it. Sorry about that. June 27, 2008: MEXICAN 2-XL TAPE IMAGES ADDED! I was recently contacted by Sergio Amante, who sent me images of four of the Mexican 2-XL 8-Track tapes made by Ensue�o Electronica! I've added the images to the 2-XL AROUND THE WORLD section. Muchas gracias, Sergio!! November 20, 2007: 2-XL AT THE OLD ROBOTS WEB SITE! There's an AMAZING new website that has images and booklets from over 50 different robots from the 80s and 90s, at www.theoldrobots.com. Anyone who loves robots should check out this site! As a result, I've also updated the 2-XL IN CYBERSPACE / LINKS section. November 20, 2007: GEEK MONTHLY RETURNS... WITHOUT 2-XL. After a several month hiatus, Geek Monthly recently switched publishers and returned to newstands with issue #8. Sadly, the "Ask 2-XL" column wasn't in that issue. According to their website issue #10 is now out, but I missed #9 so I don't know if it was temporary or if the column is gone for good. October 21, 2007: 2-XL SINGING JUKE BOX ADDED! Now that there are free online streeaming MP3 players, I set up a jukebox with some of the songs that 2-XL sings. They're not the best quality, and it's not all of them... yet. It's posted on the 2-XL MUSIC page. June 21, 2007: "MEGO DEMONSTRATION PROGRAM" INFO ADDED! After 27 years of searching, I've finally obtained a copy of the floor demo MEGO DEMONSTRAION PROGRAM!! Program info now posted in the MEGO 2-XL TYPES 1 & 2 section! And to make it even better, since this program is so rare, Mouser has generously agreed to put a copy of it on his 2-XL Emulator at DonationCoder.com! Stay tuned!! April 11, 2007: 2-XL SIGHTINGS AT GEEK MONTHLY AND THE ORTHEPAEDIC CHEESE SURGEONS! GEEK MONTHLY is a new magazine that has a column called "ASK 2-XL"!! You can check out the magazine (not to mention get all the latest news) at geekmonthly.com. I've been contacted by the magazine and they say they're hoping to get in touch with Dr. Freeman to interview him for the magazine. So Dr. Freeman, if you're out there reading this, someone would like very much to talk to you!! THE ORTHEPAEDIC CHEESE SURGEONS have made a very cool tune that includes lots of 2-XL samples! You can listen (and even download it) on their myspace page at www.myspace.com/thecheesesurgeons. Thanks, guys, for keeping 2-XL alive!! Dec 7, 2006: TAKING A BREAK. Due to various things in my personal life I haven't been able to do any updates to the site for quite some time. This also includes not getting around to checking the 2xlrobot.com e-mails. I apologize to everyone who e-mailed me and has been waiting for a response. Unfortunately I don't expect this situation to change any time soon. 2xlrobot.com still means a lot to me (2-XL will always be my Bionic Buddy), so I intend to make sure the site stays open, but for now it will just be archival. Please remember to check the FAQ for questions regarding where to find 2-XLs, 2-XL tapes and power plugs. Thanks to everyone for their support. See you after the tape clicks! May 31, 2006: THE "LETTERS TO THE INVENTOR" SECTION WILL BE DOWN FOR THE NEXT 24-48 HOURS.WEEKS. Yes, it's because of the spambots. I apologize for the inconvenience, and thank everyone who's been wading through all that garbage to post anyway. (A) Don't be afraid to post in the Letter to the Inventor section. I know the spam in there has gotten TERRIBLE. Rest assured that anything the does not mention 2-XL or Dr. Freeman is deleted every 12 - 24 hours, leaving only your posts. I realize that a lot of this spam is very objectionable and I am looking into what my options are to stop it from happening. I don't want to shut that part of the site down, but I may have to for awhile so the spambots think its gone and stop trying. (B) I haven't been answering my e-mails lately, and I apologize. My work schedule has changed and I sadly have less free time now. I realize I was behind on answering everyone before and it's gotten really bad, for which I'm sorry. (C) There's still more to come on this site! I still have plans to post images for all the Tiger 2-XL programs, as well as reviews and sound files from many, many more 2-XL tapes. Plus with lots of help from ALL OF YOU we now have LOTS more of the 2-XL library music identified! I just have to get it all organized and uploaded. 2xlrobot.com has NOT been abandoned, it's just slow going for now. Thanks to everyone for your patience, and for coming here to 2xlrobot.com! February 10, 2006: FIRST MEGO COMMERCIAL ADDED! I finally have a copy of the first Mego 2-XL commercial, and have finally been able to make a video file of it! The copy of the commercial I had runs a little slow. The file is an .avi file at 6.9 Megs, and is posted in the 2-XL ON TV section. Enjoy! Septmeber 30, 2005: SIX MEGO LITTLE BOOKLETS ADDED! At long last, here are the remaining .pdf Little Booklet files made by Brandon! The new booklets posted are for Astronomy / 2-XL in Space, Games & Puzzles Number 1, Metric System / Education, Super Heroes and Comic Books Cavalcade, "Talking Calculator" and Number Game, and TV and Movie Challenges. Brandon also made a booklet for Monsters, Myths & Legends, which is a higher quality scan than mine, so I've added it as well. So once more, I send out a big THANKS, BRANDON!! These programs can all be found by clicking on the links above, or by going to the individual program pages in the MEGO 2-XL section! July 12, 2005: ALL REMAINING MEGO 8-TRACK IMAGES ADDED! My scanner woes have been fixed! And to celebrate, I've now added scans of ALL the remaining 2-XL Mego 8-track tapes! A few of the 8-tracks (such as Reading, Writing & Arithmatic) had reviews all finished and were just waiting on images. There are no new booklets or button cards added yet, but many people have generously sent me scans of them, and now that I have all the tape images in place I can start organizing and uploading the booklet & card images. Watch for them to start coming soon! The scans of all the Mego 2-XL 8-track tapes are available in the MEGO 2-XL section! I've updated the 2-XL MUSIC section to include samples of the music from PRE-SCHOOL BEDTIME STORIES, which is a heck of a lot of music. I've also been able to identify a little over half of everything on it, including some tracks from the PARRY MUSIC LIBRARY, which are all new listings to the page. Confession time-- The reason I've been focusing on the music more than the program write-ups and booklets lately is because I haven't had a scanner hooked up to my computer for months, but I do happen to have an 8-track player hooked up to my computer. SpoonfulX has sent me a lot of great little booklet scans, but I still need to scan the actual tapes. I'm hoping to have scanner access again soon though. May 26, 2005: 2-XL UNDER ATTACK!!!!! Okay, I've been keeping up with deleting the spambot attacks on the "Letters to the Inventor" section, but it's just been brought to my attention that the main page is now being hit with pop-up ads. Make no mistake, THERE SHOULD BE NO POP-UP ADS ANYWHERE ON THIS SITE. If you're getting them when you log on here, then someone else has found out a way to work them in to my site, and I WILL be doing everything in my power to learn how to track it down and stop it. March 27, 2005: "LETTERS TO THE INVENTOR" section cleaned up. Unfortunately the Letters to the Inventor section has been hit by some massive spam generators over the last two weeks. My apologies to everyone for not catching this sooner. It's now been cleaned up, and all the offensive material has been removed. I'll be keeping a closer eye on it to make sure this doesn't happen again in the future. March 2, 2005: Mouser's 2-XL SIMULATOR is now open! Remember back in December I said there was a possible upcoming project I hope to discuss more later? Well, Mouser's gone public with it, so I'm very happy to be able to share it with everyone here-- Mouser has come up with a 2-XL simulator that runs on Flash software and completely emulates 2-XL! It's completely interactive, right down to plugging him in and turning him on to get the program started. He's posted it on his website at http://www.donationcoder.com/. This is a REALLY cool site! Since it takes up so much bandwith, Mouser is also asking for donations to help keep it running. Also, if anyone else can help convert 2-XL tapes into MP3s so he can add more programs, please let him know! He has information on how to contact him and work with him at his site. To try out the 2-XL Simulator, go to http://www.donationcoder.com/. Halfway down the page is a list of Individual Pages, which has the link to it, "2XL Simulator." Many people have talked about doing this, but kudos to Mouser for being the first one to get it done and on the web, and for doing such a terrific job! to the World of 2-XL since its relaunch on September 28, 2002. 2-XL is a creation of Dr. Michael J. Freeman, Ph.D. US Patent #4,078,316. Other Patents Pending. This is a fan site and is not affiliated with Mego Corp., Tiger Electronics, Fisher-Price, or Dr. Freeman. No copyright infringement is intended.